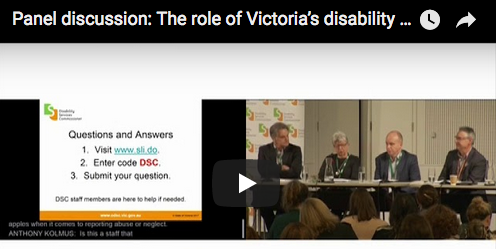 The Board and Staff of Women with Disabilities Victoria are delighted to invite you to our Annual General Meeting on Thursday 30th November at 1pm to share with you our progress from the 2016–17 financial year. The AGM will be followed by a special event, Free and Equal. To attend both, please register for both. Register for the WDV AGM with Eventbrite or call the WDV office on 9286 7800. As part of the Victoria Against Violence – 16 Days of Activism campaign, we would like to invite you to this special event. Thursday 30 November at 2:30pm in Melbourne. and a showcase of some of WDV’s recent work to prevent violence and empower women with disabilities. Free and Equal follows WDV’s AGM but they are separate events. If you would like to attend both please register for both. Register for Free and Equal with Eventbrite or call the WDV office on 9286 7800. The NDIS pathway is about how easy it is to use the scheme. The re-designed pathway is focused on face-to-face meetings for all plans – no more phone calls. The new pathway will be piloted and tested over the coming months before being rolled out nationally. The NDIS page describes the pathway and it has an Easy English translation and a Disability Loop plain language translation. The NDIS is rolling out in Maribyrnong next year and Council would like to make sure everyone has a chance to be informed, ask questions and raise concerns. Monday 20 November, 6-8pm. Register or contact the organiser for the NDIS Maribyrnong forum. A Deakin University study found that 30 per cent of disability service staff weren’t confident that they would know how to recognise or respond to disability abuse. “There are some very obvious things like sexual assault that people recognise. They may not know what to do but they do recognise sexual assault as unacceptable and intolerable. But there are much more subtle forms of abuse that are quite concerning and destructive that quite concerning, that undermine people’s self respect, that are demeaning. That’s what we see as the bottom line. The power differential needs to be very explicit and we know how to work respectfully and how to affirm people when they do disclose. It’s not just about in incident report. It’s not just about managing it up. It is about working with the person that’s made the disclosure. ANZ is rolling out debit cards which include a range of accessibility features to assist vision-impaired Australians with their everyday banking needs. Carly Findlay's five tips for writers and editors talking about disability - see them on her blog.